Upcoming Events — Inspirica, Inc.
Bid to win fun & exclusive experiences like a private in-home brunch with a “Top Chef” finalist, one-on-one lessons with golf pros & tee time at the area’s premier country clubs (three different packages available)… and more! This spring, help us celebrate journeys from homeless to home. Join us for our Spring Soiree, taking place April 25 from 5:30 to 7:30pm at the Main Stage at the Palace Theatre in downtown Stamford. NEW - More tickets now available! Due to overwhelming demand, we have made a limited number of additional tickets available. Please click the below button to purchase your tickets today before they are sold out! Mark your calendars for Fairfield County's Giving Day! On Thursday, February 28, our community will unite around causes they believe in and support local nonprofit organizations. We hope you will contribute to Inspirica through our Fairfield County Giving Day page, so that we can continue to help the most vulnerable among us and achieve our mission to break the cycle of homelessness. Homelessness is a problem we can solve. We need your help to get there! 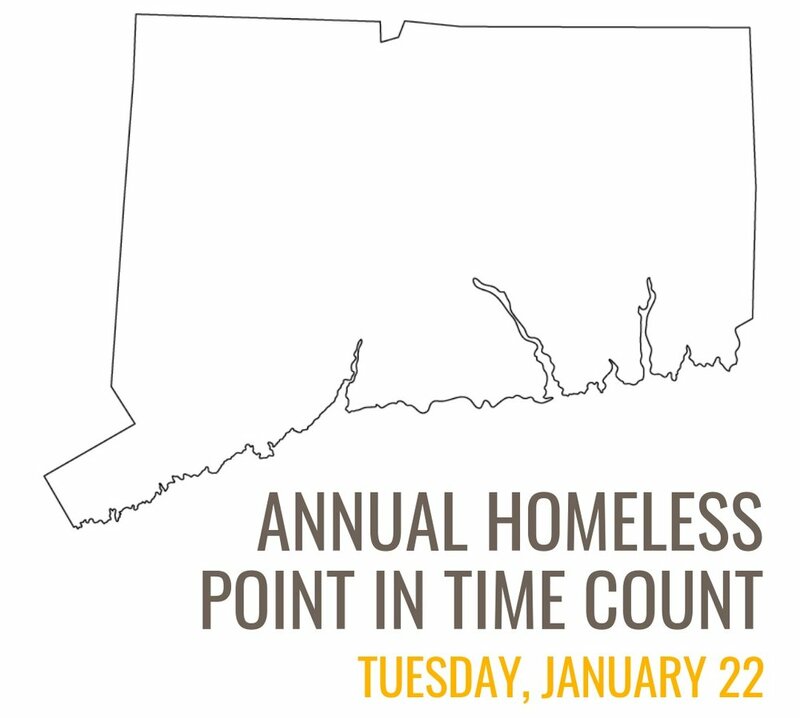 Join hundreds of volunteers throughout Connecticut as we conduct the annual Point-In-Time (PIT) Count, a physical count of homeless persons that takes place across the country on Tuesday, January 22. December 20 marks the winter solstice, the longest night of the year and the beginning of deep winter, an especially difficult time for those experiencing homelessness. We hope you'll join us for our annual Memorial Service for Homeless Persons, a moving tribute to those who have experienced homelessness. All are welcome to the service and to light a candle to commemorate those who have passed over the course of the year. 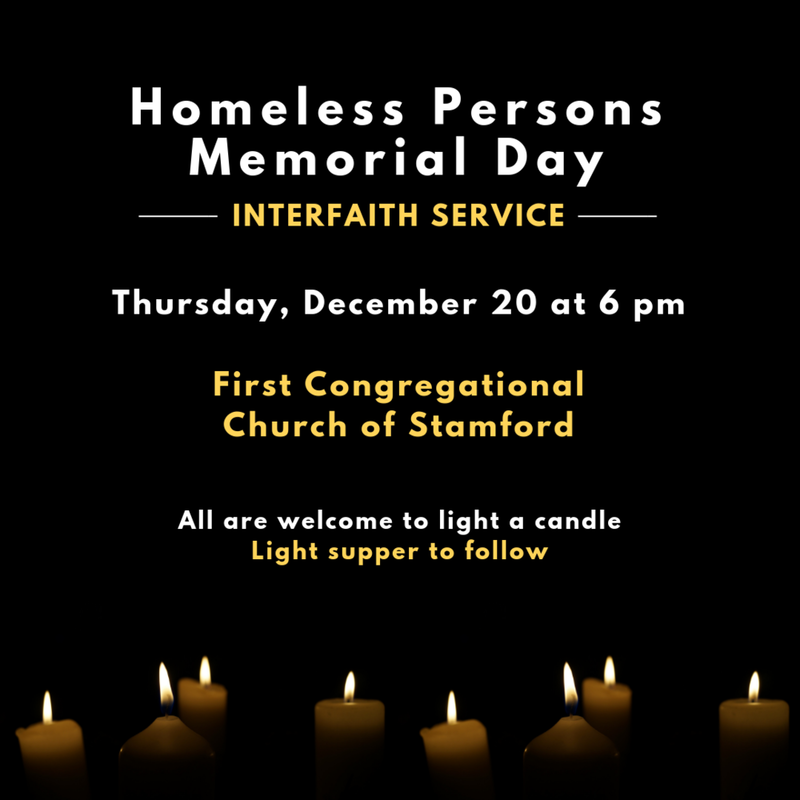 Held in conjunction with the Interfaith Council of Southwestern CT, Laurel House, Inc., Liberation Programs, Optimus Healthcare, New Convent Center, and Pacific House, the service will take place at the First Congregational Church of Stamford (1 Walton Place) on Thursday, December 20 at 6pm. A light supper will be served afterwards. 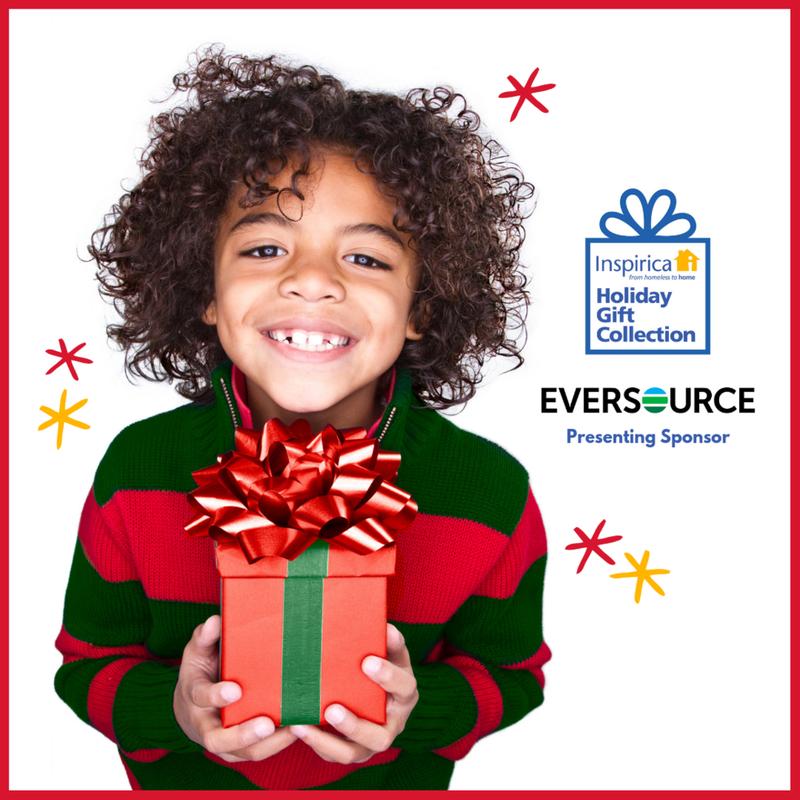 With gratitude to presenting sponsor Eversource and amazing support from hundreds in our extended community, we will deliver holiday cheer to 2,815 children in need! Thank you for making the magic happen. For more info on the impact of Holiday Gift Collection and some fun pics from our Toy Workshop, please click here. Thanks to incredible community support, we were able to make Thanksgiving a festive occasion for 800+ families in need. We’re so grateful! 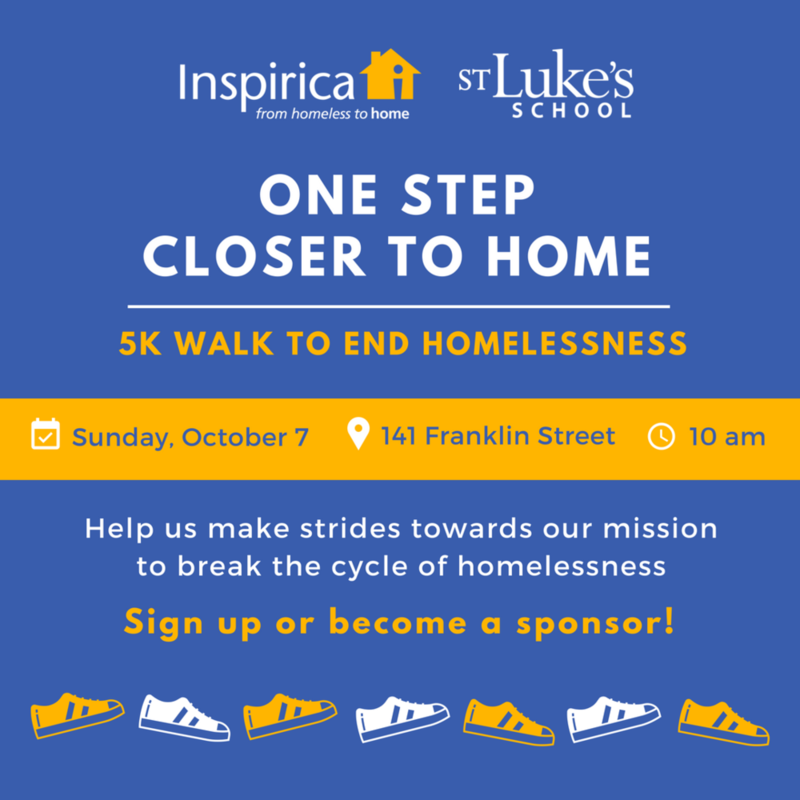 Join us for the 6th Annual One Step Closer to Home Walk-A-Thon on Sunday, October 7 and support Inspirica's work to help deserving individuals move from homeless to home. Organized by Inspirica and St. Luke's School, this 5K welcomes people of all ages to join in a walk through downtown Stamford to help end homelessness. Help us kick-start the year for the children in our care – donate school supplies to ensure they go back to school in style and ready to learn! From now through August 24, we’re collecting school supplies: wish list and details for drop-off here. Whether it's a composition book here or a pack of crayons there, any little bit you can donate will make a HUGE difference in the lives of the children in the shelter! On April 26, 2018, we were fortunate to have nearly 300 supporters join us at our annual Spring Soiree. During the evening's program, we highlighted all of the small things we do as an organization. Please take a look to see that what makes us special isn't so much what we do, but how we do it. It's the small things in life that define us, and it's the small things that ultimately define Inspirica. On April 20, 2017, we were fortunate to have nearly 300 supporters join us at our annual Spring Soiree. During the evening's program, we highlighted our children.Please take a look to see why our focus on working with children is critical to permanently breaking the cycle of homelessness. Join us as we celebrate the successful journey of our clients from homeless to home! There are thousands of individuals and families in shelter at any time, and hundreds more living without shelter in Connecticut. Only by knowing who, where, and how many people are experiencing homeless in CT can we plan and identify the resources needed to best serve the most vulnerable, and ultimately move families into permanent housing. WE NEED YOUR HELP WITH THIS YEAR’S ANNUAL POINT IN TIME COUNT! WHAT: The Point-in-Time Count is a one-day count of sheltered and unsheltered homeless individuals and families across the United States. The U.S. Department of Housing and Urban Development (HUD) requires that each count is conducted at the end of January every year. Join us on January 24, 2017 to make a difference in the lives of homeless men, women, and children throughout Connecticut by taking part in the nation’s largest homeless census. WHERE: Meet at 141 Franklin Street and be sure to join us back at Franklin Street for hot cocoa after the survey is complete! Join us Wednesday, December 21, 2016, at the National Homeless Persons Memorial Day Service as we remember the homeless who lost their lives this past year. 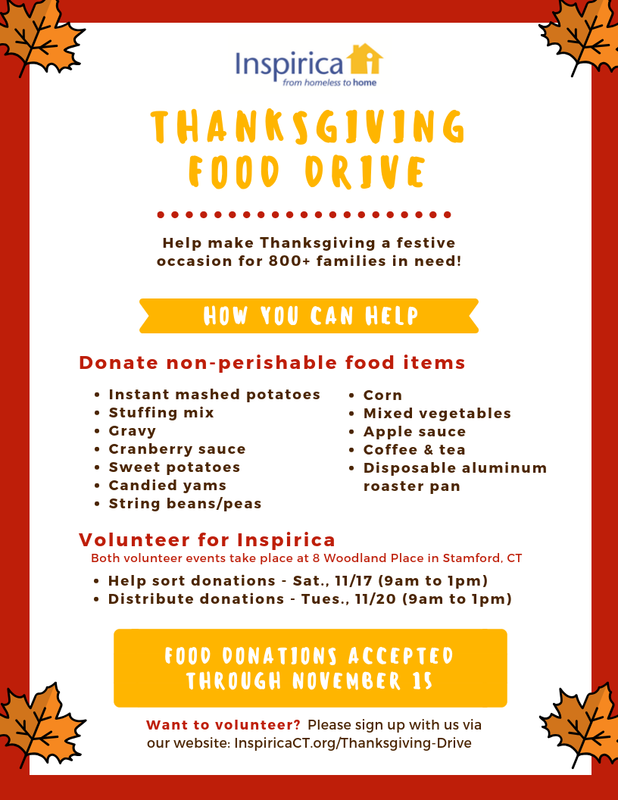 Inspirica is hosting its annual Thankgiving Giveaway and we need your help to fill the Thanksgiving tables of our clients! Click here to see which items we are collecting and how YOU can help! Thank you to the nearly 300 friends and family of Inspirica, St. Francis, and St. Luke’s who came out on Sunday, September 25, 2016 to support the 5k Run/Walk to #EndHomelessness! As a result of your support, we can continue our work in breaking the cycle of homelessness and place more men, women and children into permanent homes. 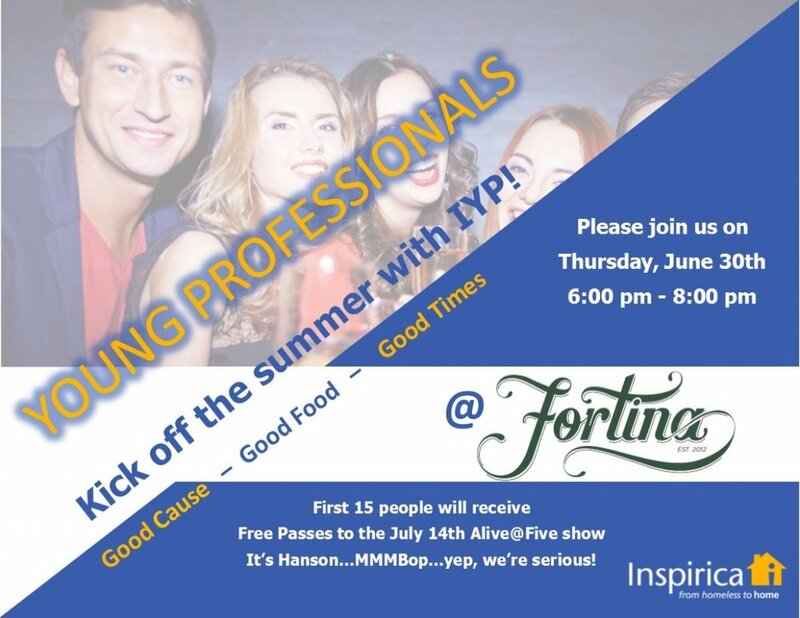 Inspirica Young Professionals (IYP) wants YOU to join us at Fortina’s rooftop on Thursday, June 30, 2016 for our summer kickoff! On Thursday, April 21st, 2016, Inspirica hosted its signature Spring Soiree at the Stamford Innovation Center. The evening celebrated Inspirica’s success in helping hundreds of people move from homeless to home. Watch the video above to hear former Inspirica client Carlos Chaparro share his experience of being a homeless youth and how Inspirica change his life! CALLING ALL YOUNG PROS- Join us Wednesday, December 14 @ Sign of the Whale! Inspirica’s Young Professionals group will host its Second Annual Back-to-School Supplies Collection August 10 – August 24, 2016 in an effort to provide the children in the shelters the tools they need to be successful in school and in life. Community members are encouraged to help Inspirica’s efforts to provide basic school necessities and help start a new school year off right! To participate in this event or additional inquiries, please contact Nzinga King at (203) 388-0127 or email nking@inspiricact.org. We are now investing resources and talent into educating our littlest learners! On January 19th, 2016, Inspirica launched our newest innovation, the Early Childhood and Parenting Program. The newest addition to our successful Children’s Services program will provide a much needed educational opportunity for our homeless youth ages 0-5. Investing in children is the most effective way to break the cycle of homelessness. The mission of Inspirica’s Early Childhood and Parenting Program is to make sure the homeless children in our care do not grow up to be homeless adults.